There are a number of people in our church community who enjoy regularly meeting to play board games. Our members have a significant collection ranging through all sorts of board, card and dice games. If you're in the Ingleburn area and looking to join us for one of our regular game sessions please use the contact form to express your interest and we'll get in touch with you. If you think monopoly is the greatest thing in board games, you need to come and experience the wide, wonderful world of euro games. Regular favorites include Xia, Avalon, Bang (Dice), RoboRally, Thunder Alley, 7 Wonders, Glory to Rome, Star Realms, Dominion, Zone7, King of Tokyo, Rampage, Power Grid, Walk the Plank, Love Letters, Seasons, Ticket to Ride, Space Cadets, Kaos Ball, Galaxy Trucker, Race for the Galaxy, Small World, Marvel Dice Masters, Formula D and many more. 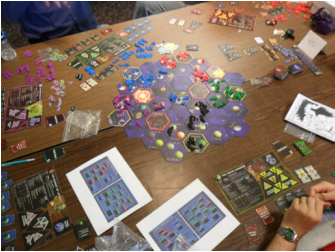 We will occasionally setup something longer like Twilight Imperium or Civilization.